"The battle is best fought on our knees, not by reading the best parenting books." I have known from my son's infancy that boys are just DIFFERENT than girls, and that parenting them is not for the feint of heart, but what a joy it is to know that, through prayer, my husband and I can raise our son to be a Godly young man! I appreciated this book because it was concise and to the point (just 51 pages! ), and it gave me hundreds of scripture references and prayers to use specifically for my son. It downloaded easily onto my iPad, so I could read it in iBooks, and will refer to it often. "May ____________ obey his parents in the Lord, for this is right (Ephesians 6:1)"
Brooke also gives Biblical examples throughout the book that inspire us to dig deeper into the Bible once we finish her book. Her example of Daniel really spoke to me. 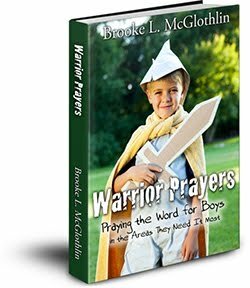 Brooke ends her book by sharing the prayer with us that she prays over her boys each night. I have printed this prayer and will pray it for my son each evening from now on - it is so powerful and puts into words what I could not. I recommend you download a copy of this book for yourself... You can find it at Brooke's website, and you can also find her at The MOB society - for Moms of Boys. You can also read other reviews about this book through The Homeschool Village, and you can WIN A COPY OF THE BOOK! *Please note that I have been provided a complimentary copy of this resource by The Homeschool Village specifically for review purposes.